Scientists hacked a standard inkjet printer to create multicolor images that can be erased and reprinted eight times on the same sheet of paper. Even as workplaces go increasingly digital, we still use an alarming amount of paper. By one estimate, every office worker in the United States produces an average of 10,000 sheets of paper per year. 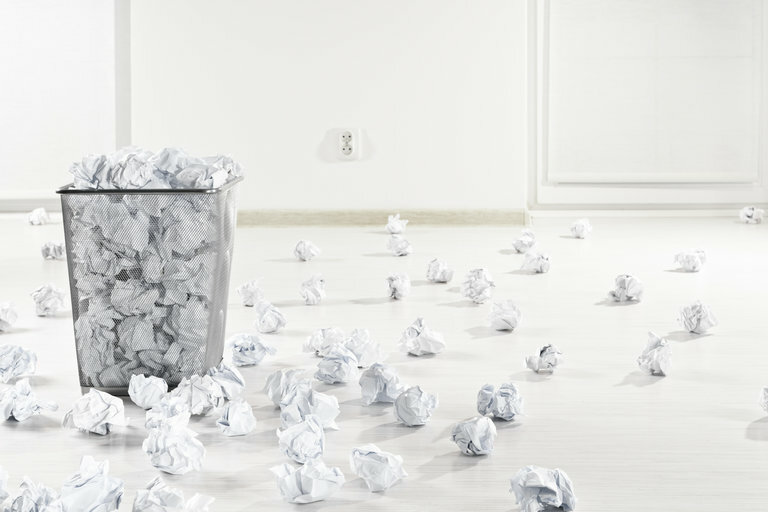 And while office paper recycling rates in the US are up to 44 percent, lots of paper still ends up in the landfill. According to the US Environmental Protection Agency, 14 percent of the 136 million tons of solid waste shipped to landfills in 2014 was paper or paperboard. And all of that paper has an environmental cost. The global pulp and paper industry is the world’s fifth largest consumer of energy, and poorly managed logging industries in Asia and Latin America contribute to rapid deforestation and habitat loss. If we can’t break our paper habit, we can at least use less of it. That’s the motivation behind new rewritable paper technology that may soon allow office workers to use the same sheet of paper to print multiple documents. A team of Chinese researchers recently combined some nifty chemistry with a standard inkjet printer to create multicolor images that can be printed and erased eight times using a single sheet of rewritable paper. The findings were reported in the journal Nature Communications. Rewritable paper isn’t your standard office paper. It’s composed of four stacked micro-layers of polymers and chemical compounds that change color when exposed to different metal salts. The chemicals in the paper are called ligands, which are molecules that bond to metals by sharing a pair of electrons. The scientists, led by Qiang Zhao and Wei Huang of Nanjing University, developed a special type of ligand compound that reflects seven distinguishable colors — brown, khaki, deep blue, pale yellow, orange, yellow, and light green — when bonded with metal salts derived from iron, nickel, cobalt, copper, and zinc. The researchers mixed the metal salts into aqueous solutions that could be injected into standard inkjet color printer cartridges. When they printed the metal “inks” on the special rewritable paper, the results were sharp, multicolored images that lasted up to six months. Not only do the ligand-metal images last much longer than previous attempts at rewritable paper — some of which faded in less than 24 hours — but they are fully erasable. That’s because the ligand-metal bonds that produce the colors can be broken by exposure to a compound called tetrabutylammonium fluoride — TBAF for short — leaving the page as white as new. Future printers could be armed with a cartridge of TBAF to erase a page before reprinting. Interestingly, the researchers calculated that the cost of printing on rewritable paper is one-fifth the cost of traditional inkjet printing, assuming that a single sheet is used eight times. But even though rewritable paper technology would ultimately save a lot of paper, and potentially money, what about toxicity and sustainability issues associated with all of the chemicals used to make the paper and ink? The researchers tested the ligands and metal salts against an array of lab-grown human cells and found the chemicals to be low in toxicity, but that doesn’t mean that they’re not exploring greener options. In the second part of the Nature Communications paper, the scientists discussed a second experimental technique for rewritable paper that uses pure water as the “ink.” For that to work, the researchers made a new type of multilayered paper with a special zinc-ligand complex that naturally reflected orange light. When exposed to water, the paper emitted a blue hue under UV light. The initial water-jet printed images were fainter than the first experiment and could only be printed in one color, but the researchers hope that this initial proof-of-concept technology will lead to even greener and cleaner methods of extending the life of paper. WATCH: Can 3D Printing Save Rhinos From Extinction?